A closing like this highlights the impact Northwest Branch has on eastern Montgomery County as well. Only 5 roads cross the creek between the Prince George's County line and Colesville. They are New Hampshire Avenue, Piney Branch Road, the Beltway, Route 29, and Randolph Road. When a major road like Route 29 gets closed, the other roads have to carry the extra traffic. Route 29 in the vicinity of Burnt Mills carries around 55,000 vehicles per day. 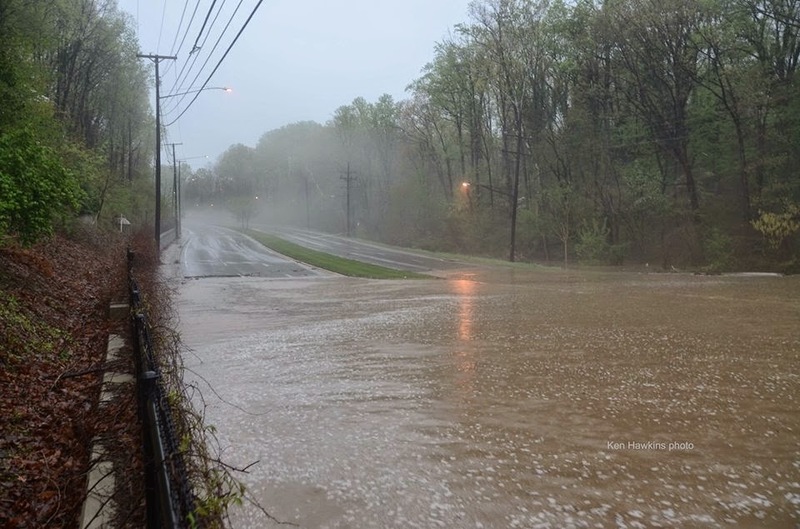 With the bridge flooded, most of that traffic will be shifted to the Beltway, as it is the next closest road crossing of the creek (1.5 miles south of Burnt Mills). The last time this happened, the road was closed for a couple days while the sediment (mud from the creek) was cleared from the bridge. The bridge also had to undergo a structural evaluation to make sure it was not damaged by the flood waters. The June 2006 storm flooded the bridge at night, and a car was washed off the road because the driver did not notice the flood in the dark until his vehicle was in the water. Sadly, the motorist was killed after his car was washed down the creek. His body was recovered in Prince George's County (where the creek joins Northeast Branch to form the Anacostia in Bladensburg) the next day, but the Prince George's County Police failed to inform Montgomery County of the discovery. Because local police were unaware the body had already been found, multiple law enforcement agencies held a massive search of the stream valley for the missing motorist during the ensuing days. This search involved police helicopters, search dogs (Bloodhounds) and dozens of police officers. The incident helped improve inter-agency communication among local police and fire departments, so there was a silver lining to the tragic death. Another view of Wednesday afternoon's flooding. Photo by Ken Hawkins. Thankfully, this flood occurred during the day, so no motorists unknowingly drove into the water. Police currently have Route 29 closed in both directions at Southwood Drive going northbound, and Lockwood Drive going southbound, and they are not allowing anyone to get close to the water on foot. 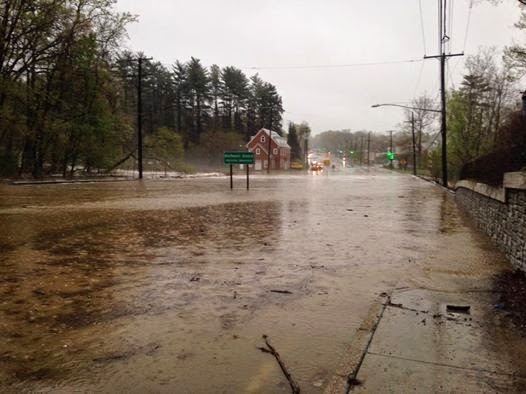 Remember, other roads in the county may be flooded, even ones that cross small creeks and streams. If the road appears to be flooded: Turn around. Don't drown. Even water a couple inches deep can wash a car off the road. If you come across a road that is flooded, but not closed down already, call the police right away so they can close it before someone else drives into the water. The rain is expected to end tomorrow morning. Nice job Sean. Never knew the area to flood during my youth growing up there (50's and 60's). I guess it wasn't until land upstream became more heavily developed thus increasing run-off that the problem of flooding reared it's ugly head. For the record, Kemp Mill Drive was also closed yesterday afternoon, it sits at the headwaters of NW Branch. The largest flood since the present Route 29 was bult (c. 1960) was hurricane Agnes in June 1972. The basement is the first part of the house damaged by flood waters. Since the basement is most susceptible to flood, you need to plan ahead to prevent a flooded basement. You can hire professionals to do this for you or you can do it yourself. This evaluation means that they will check your home for the structural damage, As well as they will check that is there any electrical issues and get an initial idea about the severity of all the type of damages and the possible health concerns that you need to deal with during the whole process of flood damage restoration method repairmen on your home. Ice dams are usually common problems for homeowners in the colder climates when the snow accumulates on the slanted roof. Carpet cleaning service in indianapolis coverings are surely a standout amongst the most essential things that we can discover in our homes.